It was an extraordinary celebration. On February 12, 2017, close to 400 people packed the pews of First Presbyterian Church of Berkeley for From Justice to Justice and Strength to Strength: A Celebration of Rabbi David Cooper. The crowd included Kehilla members and supporters, folks from the broader Jewish community and social justice colleagues of Rabbi David’s. 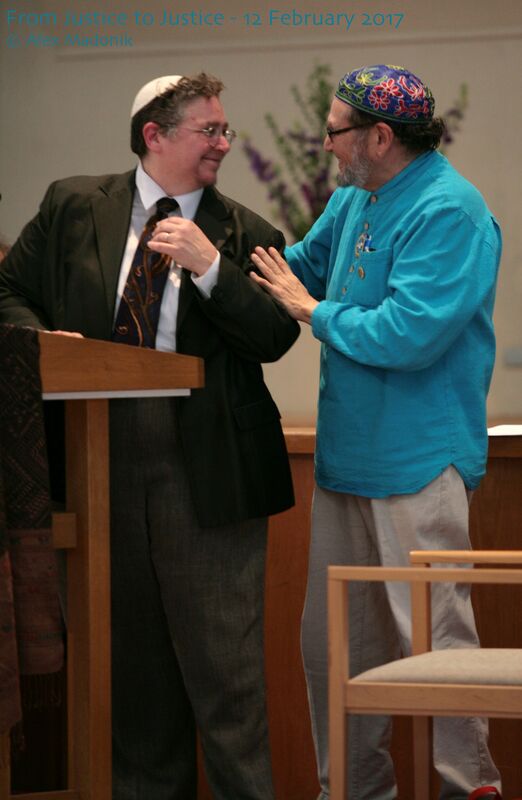 A powerful testimonial to Rabbi David and the impact of his work for justice by Rev. Phil Lawson, a longtime civil rights leader and former colleague of Dr. Martin Luther King Jr.
For the first half of the evening, I had a birds-eye view of the crowd as they listened to the tributes to Rabbi David. I watched as people were moved to tears and laughter as each person spoke or sung. The sanctuary was filled with love and appreciation for Rabbi David and this marvelous community that he has helped to create. The event happened due to the efforts of many people. Generosity Committee Chairs Marjorie Cox and Julia Epstein and Generosity Consultant Susan Freundlich put in dozens of hours to organize and produce the event with grace and skill. 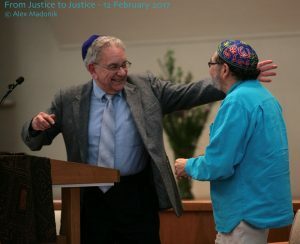 Alex Madonik took photos and made a sweet slide show of Rabbi David’s life. Norma Mark, with help from Madeleine Adkins, designed a beautiful event program. Carol Rothman and Remedios Martinez-Cantu made spectacular flower arrangements. Barbara Cohen and Jon Levin coordinated desserts and drinks. And members of the Kehilla’s Generosity Committee, Board of Directors and staff and dozens of Kehilla volunteers did all of the small things necessary to hold such a complex event. We couldn’t have asked for more. We honored our beloved Rabbi, brought together our community, received inspiration during these challenging political times and raised over $20,000 to continue the work of the Kehilla Community that Rabbi David has been so generous to help build.